Playa Mujeres is a beautiful, relaxing resort just a short distance from the hustle and bustle of Cancun. This upmarket resort is home to many luxury hotel and resorts offering first class accommodation, service and location. The undoubted star of this resort is the idyllic white sand beaches that offer stunning views and are gently lapped by the crystal clear waters of the Caribbean Sea. There are a fantastic range of hotels offering pure luxury, from intimate boutique style properties to large adult only resorts; they prove particularly popular with honeymooners and couples celebrating special anniversaries. Holidays to Playa Mujeres are an ideal choice for rest and relaxation and to switch off from everyday life. 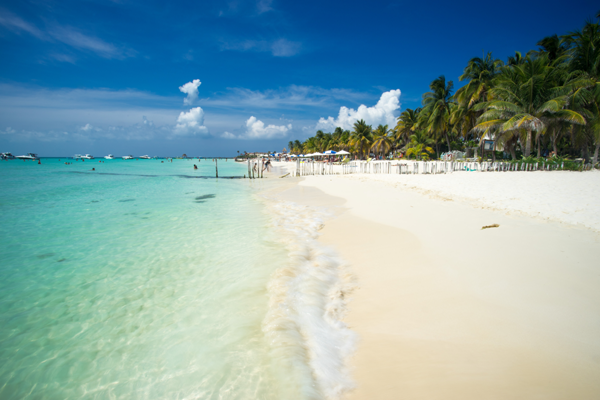 The small marina area at Playa Mujeres is the departure point for boat trips including yachts and deep sea fishing trips for marlin and tuna in the clear waters of the Caribbean. Golfers can tee off at the Playa Mujeres golf course and enjoy a relaxing round of golf. For a night out, downtown Cancun is around twenty five minutes drive away and offers an excellent choice of restaurants, bars, clubs and of course the world famous Coco Bongo. Enjoy a relaxing Playa Mujeres holiday and stay in one of the top hotels in the area, have a browse around our site or call one of our friendly travel agents today.